Congregate Dining is offered once a month from September to June in the townships of Woolwich, Wellesly and Wilmot by Community Care Concepts. 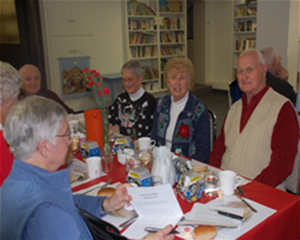 Congregate Dining is a community based meal service that is intended to increase opportunities for nutritional and social support for seniors and disabled adults. By offering balanced meals, social activities, information and resources we contribute to the clients overall well-being. Healthier seniors are able to remain in their own homes longer and live a productive, active lifestyle. There is a fee for this program. Please click here for more information regarding Community Care Concepts.